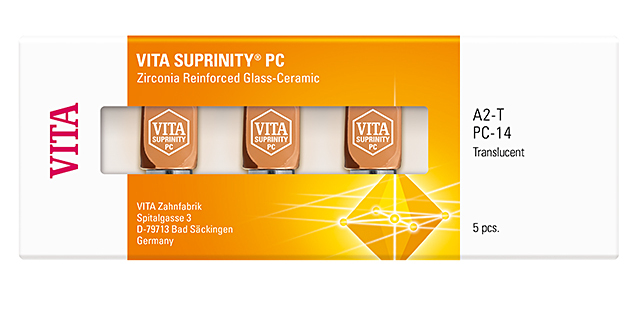 VITA SUPRINITY® PC - Glass ceramic. Revolutionized. VITA SUPRINITY PC for CEREC/inLab, 5 pcs. 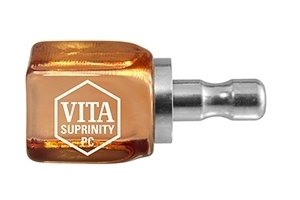 VITA SUPRINITY PC UNIVERSAL, 5 pcs. What stains can be used to characterize VITA SUPRINITY PC restorations and what is the exact procedure in this case? VITA AKZENT Plus stains, available as POWDER, PASTE or SPRAY, and glaze material, are applied to the restorations after full anatomical milling has been completed. Characterization using Effect Stains and Body Stains and glaze material can be performed either in combination with or following crystallization firing. What is of particular importance when customizing VITA SUPRINITY PC restorations? What needs to be taken into consideration during processing? With the cut-back technique, incisal or occlusal reduction is performed to allow for layering using the VITA VM 11 materials that have been optimally adapted for this purpose. Thanks to the outstanding surface wettability, layering can be applied directly without liner firing or washbake. The minimized application of ceramic materials adapted in terms of shade facilitates highly-esthetic restorations in just a few steps. What firing units are required for thermal firing and what must practice offices and laboratories observe in this regard? The restorations can be crystallized in any vacuum furnace that supports slow cooling. Honeycomb firing trays with platinum pins are the most suitable for firing. No particular aids are required, and as a result of the superior firing stability of the base material, firing paste is not required either; it can, however, be used additionally in the fabrication of a custom firing tray. How should VITA SUPRINITY PC restorations be polished, and what polishing tools should be used? Reworking should only be performed using fine-grained diamond-coated milling tools (4 μm) and special polishing tools (for pre-polishing: diamond finishing bur / 8 μm) at low pressure. For optimum polishing, a 2-phase polishing range for extraoral and intraoral use has been specially developed, which allows a natural highgloss finish to be achieved quickly and easily using the VITA SUPRINITY Polishing Set technical and clinical.